Annie Clougherty, Senior Travel Consultant at our Ipswich travel agents in store at Coes, travelled to the Italian island of Ischia for a relaxing two-day trip. Here’s what she got up to. Stansted airport was very busy, however, we had Fast Track through security which was excellent as we would have been very rushed without it and would have had to wait in the long queues. We boarded the flight and found our pre-booked seats. The flight was only 2 hours to Naples and this went very quickly; there was a snack/drink service and then it was time to land. The Excelsior is a 5* hotel in the centre of Ischia main town. The location was excellent as it was close to all the local shops and restaurants and just a short walk from the main beach and castle. The hotel also has its own beach with a cafe just across the road. The hotel was spotlessly clean with a beautiful heated pool outside and another inside. We were all given junior suites which were spacious with a small sitting area, tiled bathrooms and showers over the baths. The beds were firm, with blankets, but the hotel owner advised us that they are happy to supply softer mattresses and duvets if you would like them. The restaurant had a lovely outside terrace overlooking the pool and the food was excellent. There was a buffet breakfast and then a la Carte for lunch and dinner. We had lunch on arrival and the food was outstanding – all freshly prepared and presented beautifully. The evening entertainment was very low key (just a pianist), but the location of the hotel meant that most people went out into the bustling little town at night to visit the local shops and bars. 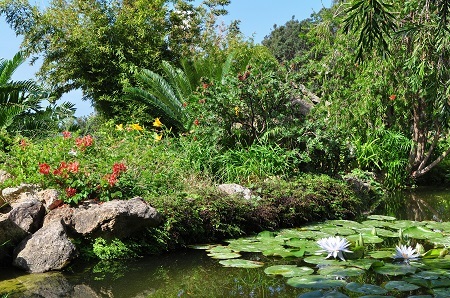 We visited Mortella Gardens which is one of the best botanical gardens in Europe. It is divided into levels where there are ponds, an aviary, an orchid house and an amphitheatre. They hold classical concerts in the garden during the summer months and the tropical plants, flowers and trees creating a spectacular setting. We had lunch at a local wine estate called Pietratorcia Vineyards. This was a small, rustic vineyard where they made and sold their own produce including marmalades and chutneys, which were delicious. We also had a visit to a spa hotel called the Miramare on the other side of the island. Here, they had 5 different thermal pools of varying temperatures, all designed to help the body with aches and pains. The excursion to Mortella Gardens was excellent. Also, the setting of the spa hotel Miramare was beautiful and I really enjoyed the afternoon there, taking in the spectacular sea views from every terrace. The pools were all really warm which soothed my muscles. The hydrofoil to and from the port of Naples did not have an outside area where you could sit, which would have been good for those members of the group who were feeling seasick. It’s a good idea to take wristbands or tablets if you think you might suffer from this. I would definitely recommend Ischia. It would suit couples looking for a luxurious spa holiday, honeymooners and anyone wanting something a bit special. It’s a very relaxing place with lots of walking, photograph opportunities, stunning scenery and lovely Italian food. I would like to thank Sarah Ayling from Classic Collection and Mina, the local Classic Representative, for taking us to some lovely places and being such great hosts. If you would like to enjoy a luxurious trip to this Italian island, let us help you plan your holiday. You can drop in at any of our travel agents on the south coast or those in Suffolk, Norfolk and Essex to speak to a member of our knowledgeable team. Must try? All the Italian food and cakes!